On this second edition of AMIFF, we received many contributions, ranging from fiction, documentary and animation, to experimental video art and hybrid films, from artists and filmmakers around the world in the field of film and art. Open Call program director Helene Eggen, together with festival director Helene Hokland has made a selection of six films for the main program, and one special work “Stream” by Alfred Benedict Marasigan. The films cover a wide range of geography, age, form and expression, and maintain a high artistic level. All the films in the programme respond to this year's theme of "Peripheries", geographical as well as political and sociological. Several move beyond conventional film genres and artforms. In the gray area in-between the cinema and the gallery. Some of the filmmakers will participate in a Q&A after the screenings. A short film produced in collaboration between Anton Benois (AUS, RUS, based in Trondheim, Norway) and Beth Dillon (AUS, based in Lausanne, Switzerland) during a 2-month winter residency at Listhus Artspace in Ólafsfjörður, north Iceland. The film follows the small-town wanderings of a literal fish out of water that appears at dawn on the harbour shore then proceeds to explore the streets and interiors of the remote town before returning to the ocean at nightfall. It is a ghostly presence, a mute observer who haunts the various sites of the village, including a cod-processing plant, a petrol station and a local home. Fisk provides a portrait of remote and exoticised localities from the perspective of the outsider, exploring feelings of disorientation and displacement within a winter landscape of long nights, twilight glows, sub-zero temperatures and heavy snows. 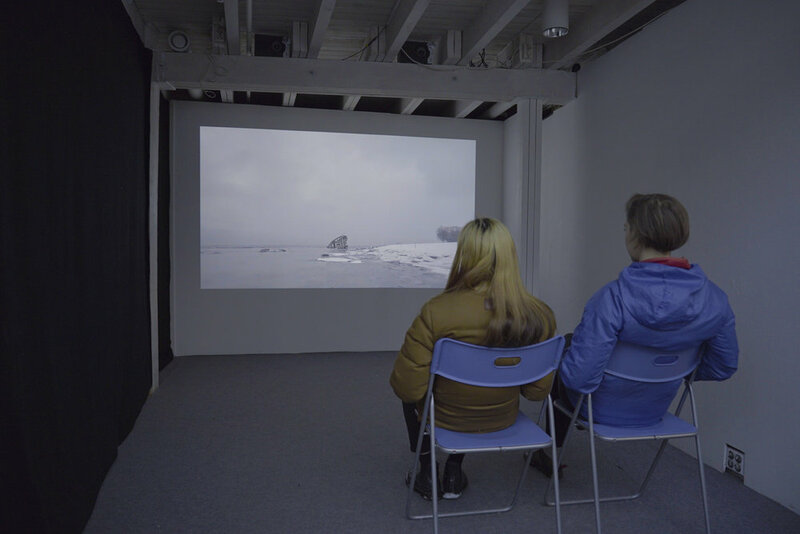 It is also a meditation on the decline of the herring fishing industry in North Iceland, musing on themes of absence and nostalgia for past prosperity. In a collaborative project ongoing for the past 4 years, artists Anton Benois (AUS, RUS, previously based in Tromsø, now based in Trondheim, Norway) and Beth Dillon (AUS, based in Geneva, Switzerland) present acts of landscape appreciation that incorporate elements of sculpture, video and performance. The work engages with shared narratives and images of the tourist and travelling artist, adopting a playful approach to behaviours of sightseeing and being seen, processes of repetition and exchange, and the aestheticisation of everyday rituals and actions. Leirdue (Clay Pigeon) is a short film based on the story of young man Azaar who’s the sole survivor from a shipwreck and who then ends up in a TV interview. On this project Luktvasslimo has worked with Synne Bjørbæk whose daily engagement is as serving deputy mayor of Bodø. Leirdue is her debut on screen. The other lead is played by Benjamin Hov Golas, a 15-year old talent who’s just about to leave Lofoten for his musical studies. The film looks at how alienating the screen format might appear when you try to mould a life drama or two into it. The music for Leirdue is composed by Luktvasslimo himself and his two cats (!) and produced in collaboration with musician Alan Stones. Trygve Luktvasslimo (1978) is a visual artist based on Valberg in Lofoten. Luktvasslimo’s work has been shown internationally in galleries, museums and festivals. He holds an MFA from Malmö Art Academy. Trygve Luktvasslimo’s recent films investigate how spiritual concepts like preaching and prophecy gets translated into entertainment and media through its idolized figures. Earlier work includes A Life with no Echo, a trilogy of films based on fictive pop star Thor and the characters and events surrounding Thor’s life. A Life with no Echo looks at the isolation and loneliness of megalomania and unwarranted artistic freedom. Thor is played by Trygve Luktvasslimo and the films include fantastic performances from renowned actors Joana Barrios, Filipe Vargas and Suzana Borges. Giovana Olmos was born in Mexico City in 1995. She is based in Montreal since 2006. Her work earned her an entrance bursary at Concordia University for outstanding portfolio in film production. During her undergraduate degree, she was awarded two production grants. Her magical realism short Mapou (2015) screened in many North American LGBT film festivals including Inside Out Toronto. Her second short, Silvia in the waves (2017) is still in the festival circuit with more than 15 international selections, a world premiere at the Festival International du Film Indépendant de Bordeaux and a merit awarded by the Chicago Int'l Film Festival’s CineYouth Film Fest. She is a longtime volunteer videographer in the LGBT organization African Rainbow, which she follows from Toronto to Brussels. This is about the mess that we leave behind after leaving the life, and people who have to solve it or merely accept and tolerate. Bohdan’s father was died and Vera also lost her husband. They meet on this common ground of loss. At the funeral, they find out new hidden facts about dead Georgy. Hanna Jalali was born in Kharkiv, Ukraine. Studied at the Institute of journalism of Taras Shevchenko Kyiv National University (B. A.). In 2015 she was graduated from Kyiv National I.K. Karpenko-Kary Theater, Cinema and Television University. M. A. in Documentary Directing and Film Production. "After" - her first short feature after graduating. On the last day of the year, a dispirited work-at-home phone interpreter has her moribund life turned upside down when she answers an unexpected emergency call. Dutch natives Brandon Grötzinger (1991) and Wander Theunis (1989) graduated as a sound designer and a screenwriter respectively from Amsterdam's Netherlands Film Academy in 2015. They have, since then, worked — each in his own field — on several shorts and feature film projects, before making their debut as co-writer-directors in 2018 with their tragicomical short film KALÍ CHRONIÁ (HAPPY NEW YEAR). Snow White Cologne is a visual poem, post-rationalising the struggle and recovery of my younger sister's drug addiction. There's love and loss, good and bad. Amanda Eliasson (b.1990) is a Swedish animation director who recently graduated with an MA in animation from the Royal College of Art, London. Now she’s working as a freelance animation director in the UK. Stream is my homage to light, place, and the moment. Inspired by the widespread use of livestreaming across all online media and the peculiar popularity of Norwegian slow TV, the project responds to the seemingly minute, banal, and insignificant narratives being told every day. My practice revolves around Canadian geographer Edward Relph’s “sense of place.” I’ve always made art in relation to where I am and I often investigate the questions “Why am I here?” and “Who am I where? How or in what form?” Introspection, phenomenology, and cultural geography are significant elements of my practice. I am a Filipino gay millennial middle-class contemporary artist; these identifiers I use for myself carry individually charged associations that I struggle to escape, embrace, repurpose, and reevaluate every day. Landscape painting has often been my entry point, middle ground, and safe space for these inquiries, and it has helped me situate myself in a world where I keep questioning who I was, am, and should be. Currently, I have been concerned with how these questions are recontextualized by my stay in Tromsø. I can feel my worldview changing drastically in a very peculiar place in the world, and I continuously attempt to negotiate my conflicted existence into historical and technological spaces through my new media works. Ultimately, the spatio-bigoraphical elements of my works consistently explore the complexities and ambiguities of belonging. Alfred Marasigan (b. 1992) is born and raised in Batangas, Philippines. He graduated from Ateneo de Manila University and have taught visual art history, painting, and aesthetics in that institution. His background in landscape painting led to a spatio-biographical practice informed by cultural geography, local Romanticisms, and virtuality. He is currently taking up his MA in Contemporary Art at Kunstakademiet i Tromsø. At the moment, his works are concerned with his experiences in Northern Norway. His other artworks have also been included in various local and foreign exhibitions in and publications with Small Projects (Tromsø), c3 Contemporary Art Space (Melbourne), The Geffen Contemporary at MOCA (Los Angeles), Galerie Métanoïa (Paris), Poh Chang Academy (Thailand), Cultural Center fo the Philippines (Pasay City), Toshima City Hall (Tokyo), Metropolitan Museum of Manila (Manila); and publications like Fordham University’s CURA Magazine, SFMoMA’s Tumblr, and Ateneo’s Heights, among others.